The global adhesives & sealants market was valued at US$ 58,153.1 Mn in 2017 and is anticipated to expand at a CAGR of 5.1% from 2018 to 2026, according to a new report titled ‘Adhesives & Sealants Market: Global Industry Analysis, Size, Share, Growth, Trends, and Forecast, 2018–2026,’ published by Transparency Market Research (TMR). The global adhesives & sealants market is driven by the rise in building and construction activities across the globe. The global adhesives & sealants market is primarily driven by advancements in the building & construction industry. Rise in the number of upcoming commercial building projects, especially in Asia Pacific and Middle East & Africa, is anticipated to propel the adhesives & sealants market in these regions. The residential and non-residential construction sectors in the U.S. has been expanding in the last few years. This trend is likely to continue during the forecast period. The residential construction sector in the U.S. experienced year-on-year growth of 10.52% in 2016 and 10.58% in 2017. The non-residential construction sector expanded by 7.71% from 2015 to 2016. Construction of health care, commercial, and office buildings have increased in the country. The housing industry in the U.S. is estimated to expand at a rapid pace in the near future. New York, Houston, Los Angeles, and Chicago are projected to represent 20% of total construction output in the U.S. by 2026. India is expected to become the third leading construction industry in the world by 2026. Volatile organic compound (VOC) emissions during the use of adhesives pose a threat to the environment. Several countries have set guidelines restricting the amount of VOCs emitted during the usage of adhesives, especially for solvent-based adhesives, in industries. Manufacturing operations are bound by rules and regulations regarding evaluation, registration, storage, usage, handling, and transportation of certain substances and their emissions, effluents, and other wastes. Violation of these regulations is expected to lead to legal compromise future business activities of the company. These environmental regulations restrain the demand for solvent-based adhesives in packaging and printing industries, as heavy penalties and losses can be incurred due to violation of these government regulations. Therefore, most market players are shifting from solvent-based adhesives to water-based adhesives. Rapid industrialization and urbanization has increased air pollution, which has affected the health of people across the globe. Several developing and developed countries such as the U.S., India, and China are facing pressure from domestic and international regulatory bodies to formulate regulations to control VOC emission and reduce pollution. Based on resin, the adhesives market has been segmented into acrylics, epoxy, poly vinyl acetate (PVA), polyurethane (PU), styrenic block, ethyl vinly acetate (EVA), and other resins such as silicone, polyester, and fluoropolymer. In terms of resin, the sealants market has been segregated into acrylics, epoxy, poly vinyl acetate (PVA), polyurethane (PU), silicone, and others such as polyester and fluoropolymer. The acrylic segment dominated the adhesives market. Acrylic resins are extensively being used in the production of heat resistant, water-based, and UV curing adhesives. Additionally, resins have robust bonding characteristics, fast setting time, and good environmental resistance. The acrylic segment of the sealants market is anticipated to expand at a rapid pace during the forecast period. Favorable physical properties such as good peel, impact, and tensile lap shear strengths are driving the demand for acrylic sealants. Excellent adhesion properties exhibited on substrates such as steel and aluminum are expected to boost their demand in automotive, consumer, and construction industries. In terms of technology, the adhesives market has been classified into water-based, solvent-based, hot melt, and reactive and others, which includes powder-based and oil-based. The water-based segment of the adhesives market is estimated to expand at a rapid pace during the forecast period due to their eco-friendly nature. Water-borne adhesives meet the standards imposed by the U.S. and European Union regarding VOC emissions. In addition to low toxicity, their high water content makes water-based adhesives less flammable and reduces hazardous waste. Based on application, the adhesives market has been divided into paper & packaging, building & construction, woodworking, automotive & transportation, consumer/DYI, leather & footwear, and others such as electronics and marine. The sealants market has been split into building & construction, automotive & transportation, consumer, others, which include industrial, woodworking, packaging, and electronics. The global automotive industry is replacing welding of engine parts assembly with adhesives and sealants to reduce the weight of the vehicle. Reduction in vehicle weight increases fuel efficiency. Automobile manufacturers are using adhesives and sealants to bond and seal vehicles’ interiors, exteriors, under-the-hood, under-chassis, and other related parts. Most major manufacturers of automobiles across the world use adhesives based on epoxy resins, as they provide strong and durable bond of dissimilar materials. In terms of region, the global adhesives & sealants market has been segregated into North America, Europe, Asia Pacific, Latin America, and Middle East & Africa. 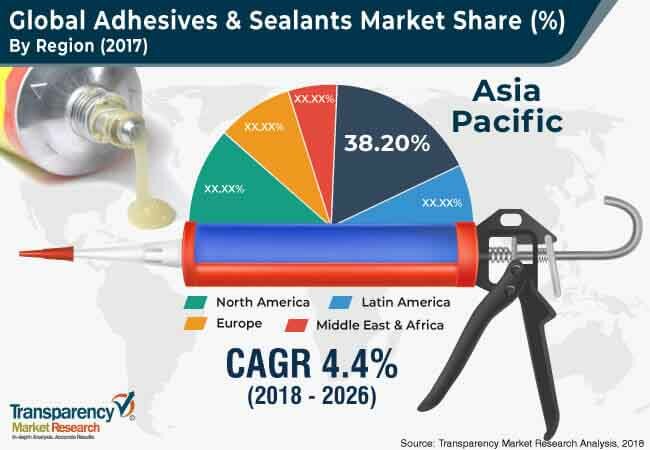 Based on consumption, Asia Pacific is expected to create lucrative opportunities in the adhesives & sealants market during the forecast period. The market in Asia Pacific, especially China and India, is expanding significantly. This, in turn, is boosting the demand for building and construction materials such as adhesives & sealants. Demand for adhesives & sealants in North America is driven by the presence of a large number of end-use industries and rising construction spending in the U.S. Moreover, easy availability of raw materials in the form of shale gas and numerous strategic initiatives adopted by companies such as 3M, BASF, and Avery Denison is expected to fuel demand during the forecast period. High degree of competition exists among market players operating in the adhesives & sealants market. The market is dominated by a few major players and is moderately consolidated. Key players operating in the adhesives & sealants market include Henkel AG and Co. KGaA, Sika AG., Bostik SA, RPM International Inc., KCC Corporation, H.B. Fuller Company, The 3M Company, Illinois Tool Works Inc., Avery Dennison Corporation, Huntsman International LLC., DowDuPont Inc., Ashland, and Akzo Nobel N.V.